Get today's deal Groupons is now active in Lexington, KY.
After navigating floating platform staircases, dodging living-room-level bosses, and searching for randomly appearing bathroom keys, most homeowners come to regret purchasing houses built by video-game designers. 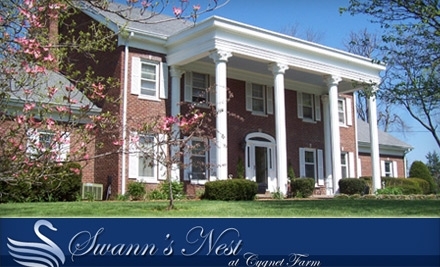 Today's Groupon offers respite from the chaos with a one-night stay at Swann's Nest Bed & Breakfast, a luxurious retreat located on Lexington's Cygnet Farm, in the heart of thoroughbred country. Just a short drive from Keeneland Race Course and local distilleries, Swann's Nest offers a tranquil backdrop for relaxing, reading, or brainstorming ways to make horses talk like people. Hostess Rosalie Swann goes out of her way to make guests feel at home, offering tips on the area's must-see attractions and restaurants. Unwind on the balcony and watch the sun set over the countryside, or relax in the garden and try to decipher the whispers of fish in the koi pond. The spacious, uniquely designed rooms come with king-size beds, WiFi, and cable. Wind down your stay with a continental breakfast, or save your complimentary bottle of wine for the morning to prime your stomach for an adventure along the Bourbon Trail.